The weather of New Years Day in East Sussex was glorious, unlike the previous day when it was wet, and cloud reduced light levels to impossible levels for photography. With little hope, my wife and I drove into Lewes to try and take a nice series of photographs of the flock of waxwings that have taken up temporary residence in an area with luscious, bright red berries. One reason for the lack of optimism was an experience we had a day or two previously when there were no waxwings present when we arrived. We were told that they had been driven off by a few over enthusiastic people. The birds had been chased backwards and forwards as they attempted to descend from a row of poplars to feed on the berries below. 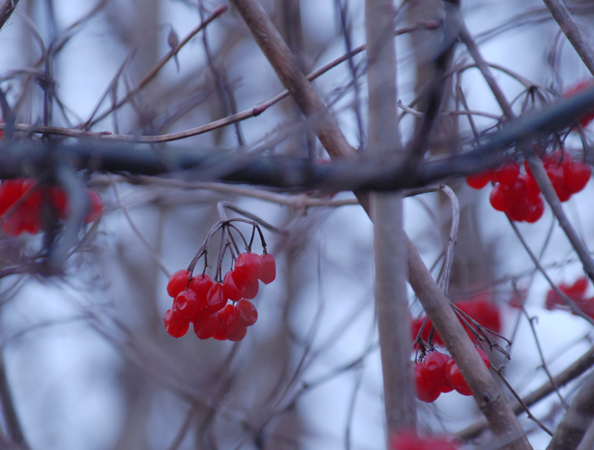 The berries were on the other side of the road from the poplars. After we had parked the car, it was another two hours before the flock returned, and I achieved silhouette photographs of them sitting high in the poplars. There were still one or two people sitting in their cars, but as soon as the birds arrived, without any care taken, they were out of their cars, and rushing towards the best vantage point, between the poplars and the berries. While I was there, sitting patiently in my car, my wife off shopping, the birds never did descend to feed, and I left without any photographic success at dusk. It was a different story on New Year’s Eve. 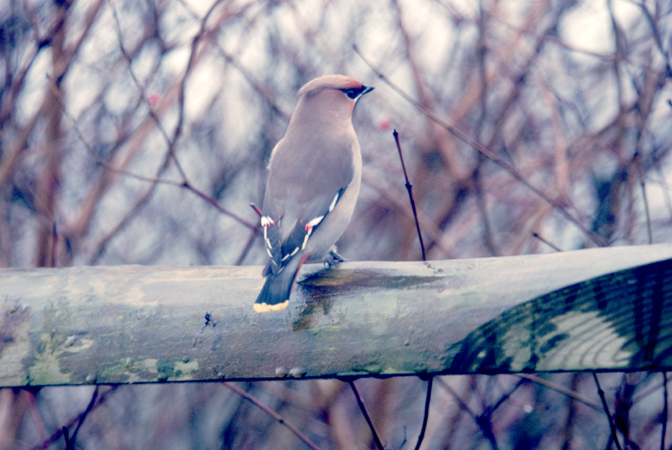 I decided to go into Lewes to do some supermarket shopping, and to see if the waxwings were behaving. Before shopping, I went to have a look at the roadside hedge with the berries. No sign of waxwings, or of people. However there really was plenty of rain. I did my shopping, and then thought I might as well go and have another go. There was one car there, and I could see its occupant was pointing his binoculars up at the poplars. 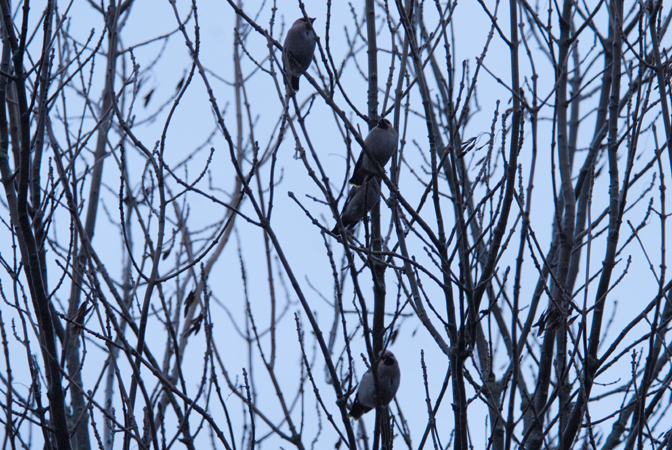 A few starling like dots in the trees proved, with the help of my binoculars, to be waxwings. After a few minutes, he came and asked me if I had managed some good photos. All I had achieved were a few distant silhouettes. He drove off. The waxwings began to descend from the poplars, and feed on the berries. For me, the hedge with the berries was on the opposite side of the car, so I drove off, and turned round. By inching the car ever so slowly towards the berry laden bushes with the window already down, I was able to stop opposite, and within about four feet of several feeding waxwings. Two problems arose however. First, as soon as I had lowered the car window, I was splattered by rain, as was my camera lens when I tried to take photographs. Secondly I had not checked to see how much space there was left on the card in my camera. At that definitive moment when a row of three waxwings posed for me on the top of the fence, no more than six feet away, I pressed the shutter button, and nothing happened. I spent the next few minutes deleting previously taken waxwing silhouettes, but by the time I was ready, the rain had increased and the light had faded even more. I managed one or two extreme close ups, beautifully filling the frame, but alas, the images when I got home were in soft focus, and not in any way sharp. When my wife and I arrived on New Year’s Day, my spirits sank as I viewed the scene. Cars were filling the available official parking where I stopped the previous day; cars were even parked on double yellow lines. At the far end of the cars, there was a knot of people very close indeed to where the waxwings had been hopping down to feed the previous day. With my binoculars, I could just make out a few sitting in the poplars. I suggested to my wife that I might as well walk down and join the crowd to see if I could get a distant shot or two of the birds in the poplars. I asked her to give me ten minutes. I strolled down to join the knot of people. To my astonishment, the waxwings were hopping down from the poplars to feed on the berries no more than five yards in front of the people. No one rushed. No one shouted. There were no sudden movements and everyone was enjoying fantastic views of stunning birds in brilliant sunshine. A motionless knot of twenty five to thirty people was far less intimidating to the waxwings than two or three people rushing hither and thither would have been. After the ten minutes I had allotted myself, I re-joined my wife in the car with a very satisfactory series of photos. One thing I have learned recently about waxwings is that they are amazingly tolerant of people, so long as the people behave with consideration. When they visit this country, waxwings are after berries, and one of the best sources of berries are supermarket car parks where berry producing bushes and shrubs have been planted as part of landscaping schemes. Cars make excellent hides, and by positioning the car close to where the birds are known to feed and waiting patiently, superb views and photographs of these charming birds can be obtained with ease. Just over ten years ago, I was doing some work in Sherwood Forest. While I was there, a Cedar Waxwing, the American cousin of our Bohemian Waxwing, was found to have joined a population in Nottingham estimated at some six hundred birds. The population had split up into a number of smaller feeding flocks which dashed about the city, spending usually no more than five minutes on a source of berries before flying off to another feeding site. By ringing Birdline, a telephone line with a recorded message giving the whereabouts of interesting birds, I found out the places where the Cedar Waxwing had been seen. I made a decision to go to a particular source of berries, and to wait. There were several birders at the site when I arrived, and their prognosis could scarcely have been more depressing. Yes, it had been seen in a flock of perhaps a hundred and fifty birds an hour previously, but as soon as the bird of the moment had been found, off they all went. 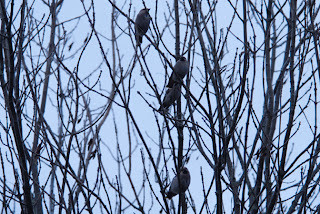 More often than not, a flock of waxwings is heard before it is seen. Waxwings sound like rather soft trim phones. They are not as loud as that other trim phone triller, the Bee Eater. It was perhaps after two hours of standing in the cold, and with eyes and ears hyper alert that a flock of about sixty birds arrived to feed. It circled the bushes several times, and the Cedar Waxwing was located. It differs very little from its European cousins, however I saw enough of it to be convinced I had had adequate views of the star bird of the moment. On that occasion, the flock did not even land, but I felt a warm and satisfying glow as I returned to my car, and drove south towards home. 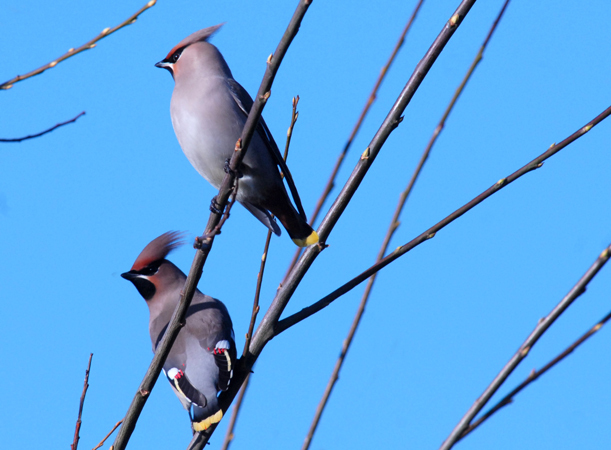 It seems that the winter of 2102/13 is being a bumper year for waxwings. They are here because they have had a particularly successful breeding season in the north and food up there has become scarce. 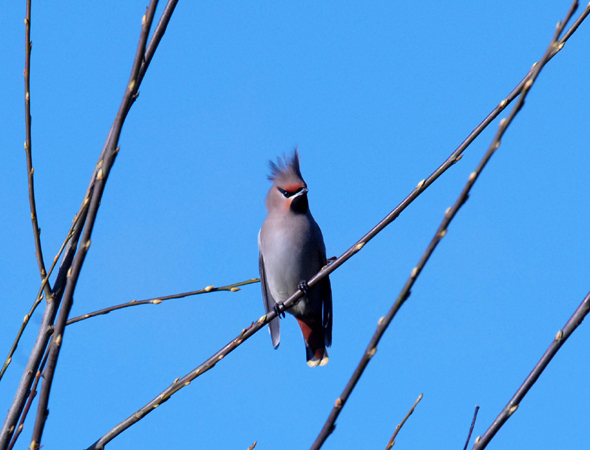 The population therefore disperses to parts where waxwings are seldom seen, in search of food. Hopefully when spring returns and with it a return to the north, a substantial number of the birds we have enjoyed will be able to return to their breeding grounds.